A place for everything, and everything in its place. 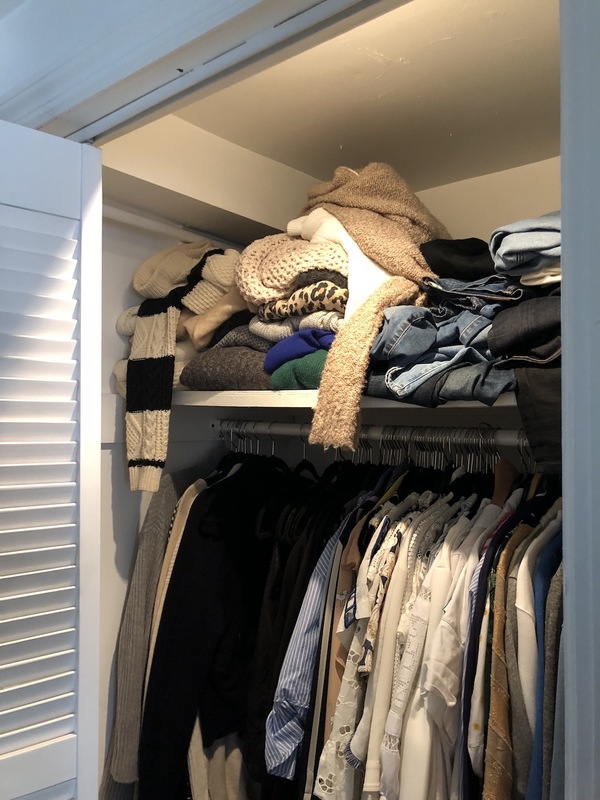 I spent a day with Horderly to have my closet organized, using The Laundress's beautiful new closet organization system. I am so excited about today’s post. 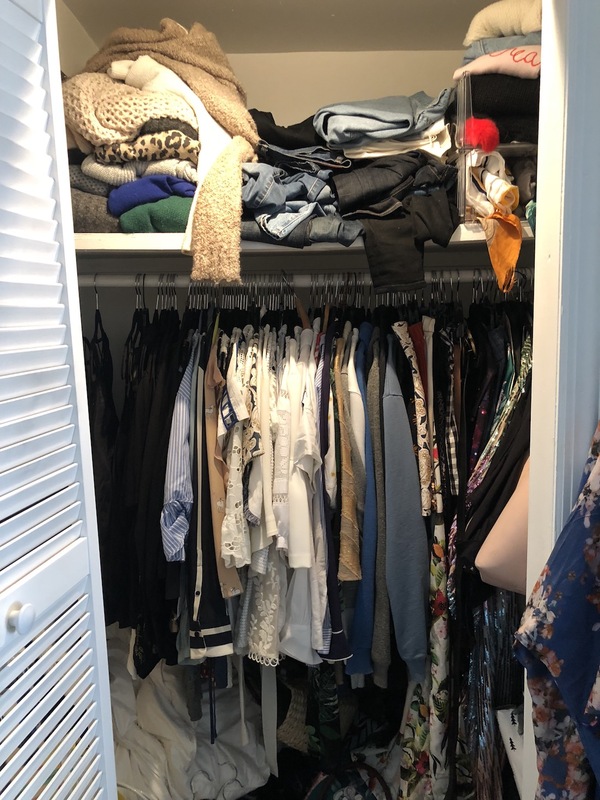 I always get asked to do a “closet tour” but honestly (until last week), have never felt comfortable sharing one as my closet area was such a total disaster. (Scroll to the bottom of the post for the “before” photos… you’ll see what I mean! 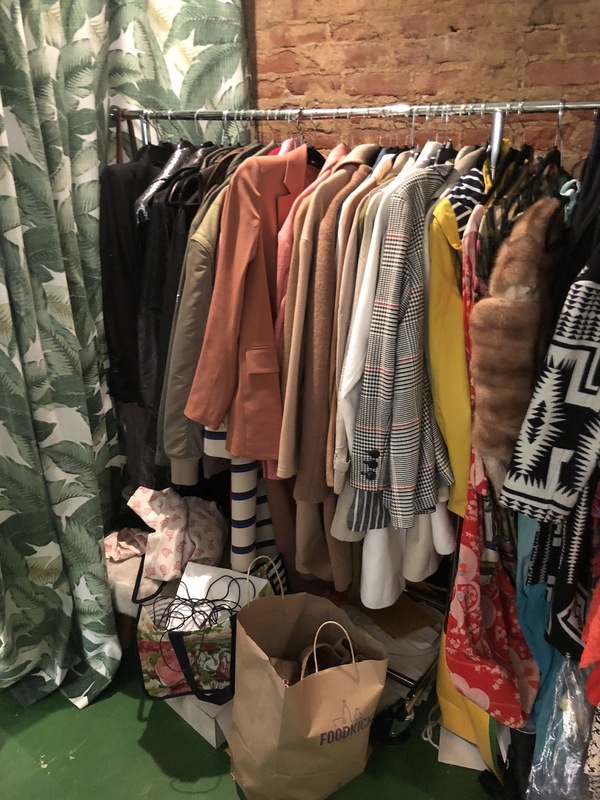 My apartment is pretty big by New York standards but only has one small closet in the bedroom so I blocked off an area in the living room (with the banana leaf fabric) where I have three rolling racks where I keep my coats, jackets, and dresses. I had my own sort of system that worked but it was a mess and I found myself often forgetting about items I owned because I couldn’t see them! When The Laundress (and Horderly) reached out about doing a post together, I was basically like “ooh yes please I need that NOW!! 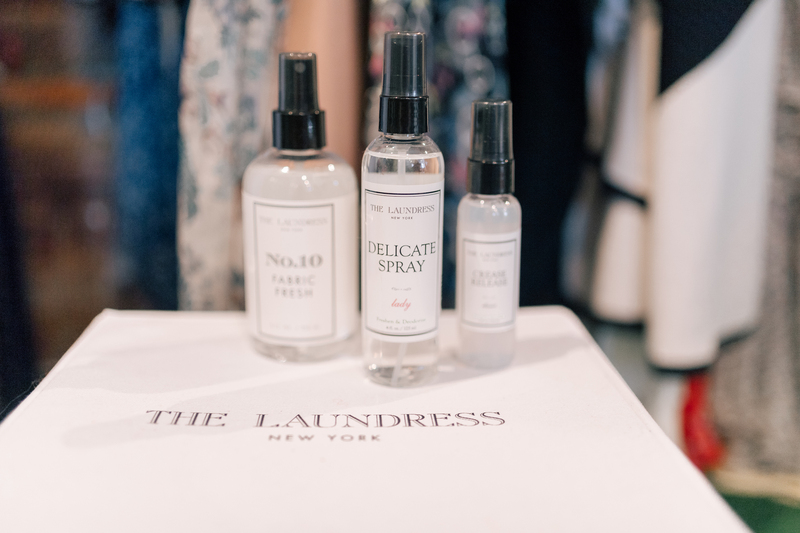 !” The Laundress just launched a new collection of beautiful closet organization essentials, and Horderly is an amazing New York City based professional organization service. 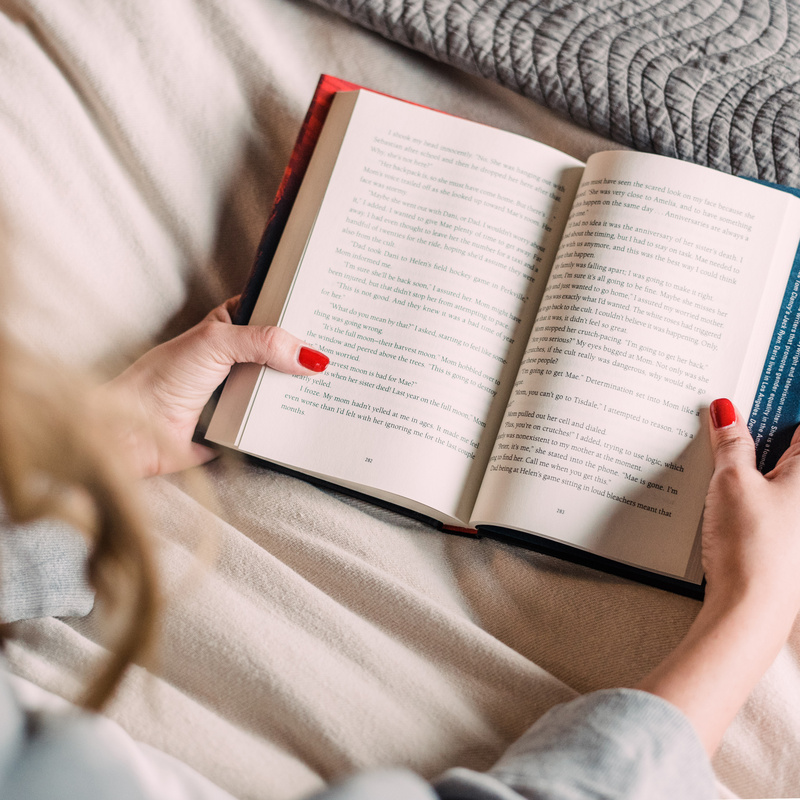 I spent an entire day with Jamie (the founder of Horderly) making some incredibly tough decisions about what could stay and what had to go and while it was a lot, I felt so much lighter and happier when all was said and done. We sold the rest to Crossroads and The RealReal and I’m donating the money that comes in to charity. So far, I’ve donated $888. I was already a big fan of The Laundress before they reached out. 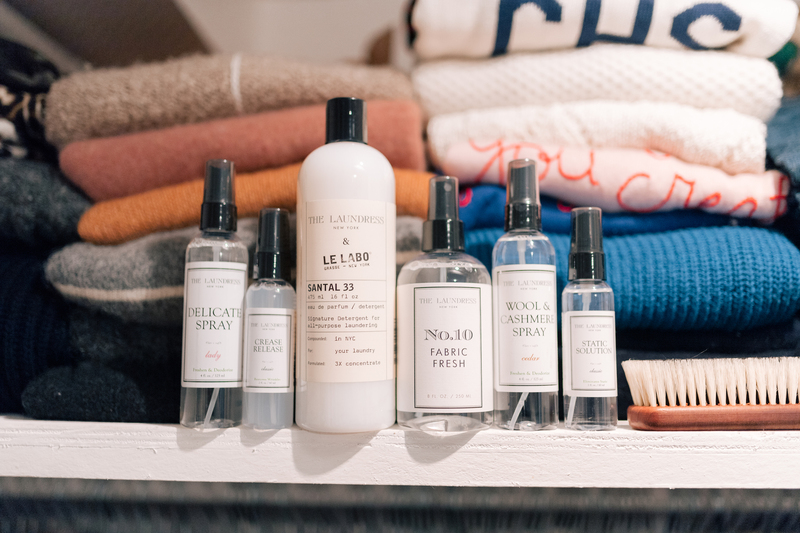 Admittedly, I bring my laundry to the Laundromat and get wash & fold (like many New Yorkers I don’t have a washer/dryer in my apartment building) BUT I do wash my delicates at home (using the The Laundress’ Le Labo Santal 33 wash which smells like heaven) and I rely on their other products (the Delicate Spray and Fabric Fresh being amongst my favorites) to help maintain my wardrobe in between washing/dry cleanings. 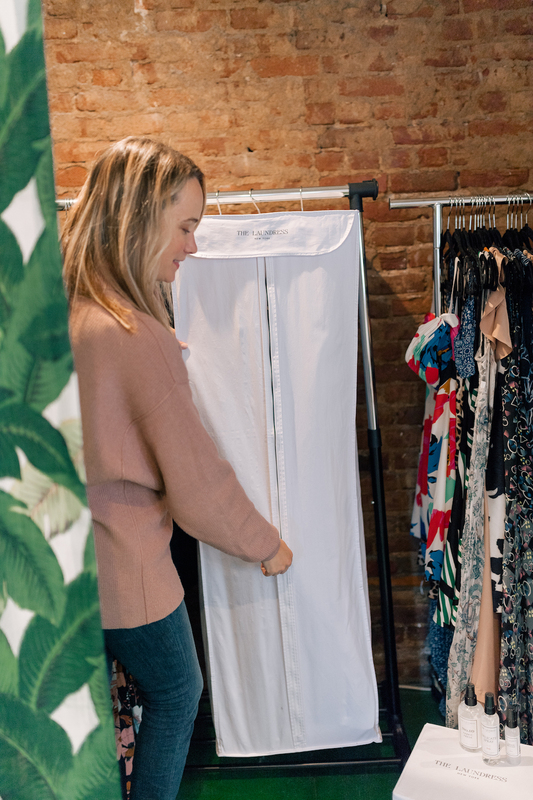 The new closet organization items are really, really nice – the perfect combination of functional and durable while still looking great. Everything is available in white and black but I personally prefer the white! 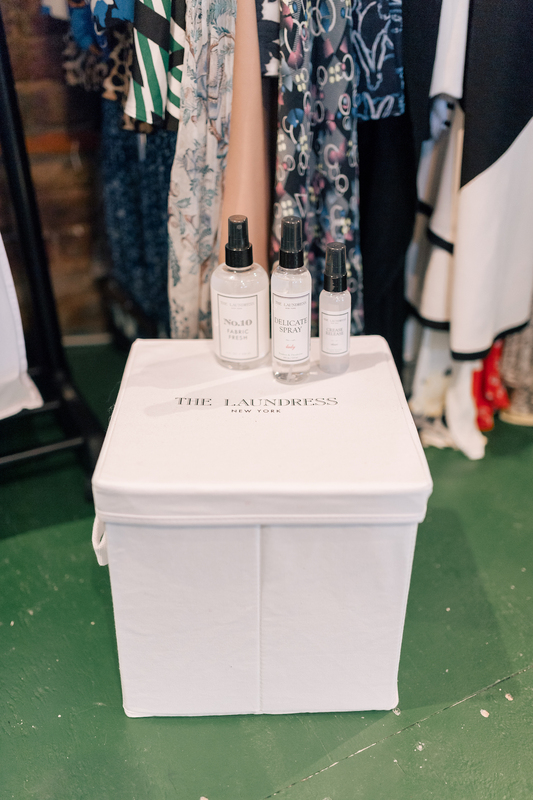 My personal favorite piece from The Laundress’s new collection was the Cotton Hanging Dress Storage Bag. This is great as it has its own self-contained bar inside of it. Jamie suggested using it as a place to keep my party dresses, which are more delicate, take up a significant chunk of space, but don’t wear as much. I love this, as I have quite a few party dresses but I definitely wear them a lot less than my other things. This keeps them safe (they’re more delicate than the rest of my wardrobe!) and tucked away for when I need them. I also really love that it will eliminate the problem of dusty hems which was a really big issue before. The few black tie gowns I own would drag on the floor, making them a magnet for dust and dirt. There’s nothing like grabbing a dress for a last minute event only to realize it now needs to be cleaned! I still can’t get over how good everything looks. 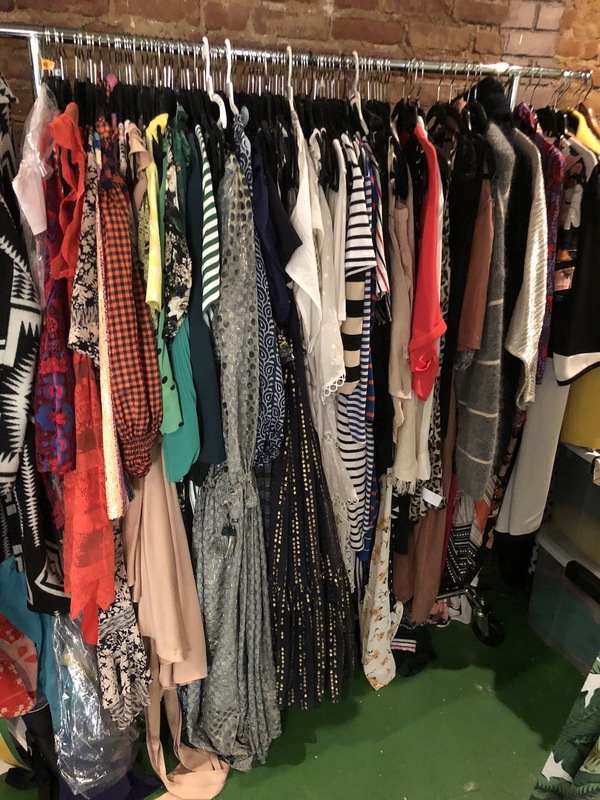 Jamie put everything onto these black velvet hangers and then sorted my closet items by item type (sleeveless dress, long sleeve dress, blazer, jacket, etc) and then within each grouping by color. Everything is SO much easier to find now!!! We used the 6-Tier Hanging Organizer to stash my scarves. I have so many scarves and wear them a lot, but they were always a mess (draped over the coat rack in the kitchen, stashed in boxes, etc). Now I can easily find the one I’m looking for! Delicate Wash, Crease Release, Santal 33 Detergent (FAVORITE! ), Wool & Cashmere Spray and Static Solution. I also really love their Cashmere Brush (for removing lint + pills) + Lavender Pouches! As I mentioned above, I was already a big fan of The Laundress. Besides making highly effective products, they’re also beautifully branded/packaged and completely non-toxic. I really love the Storage Boxes. I like the simple clean lines of the boxes. They are ultra sturdy and will keep your belongings safe from dust and moisture. They come in 3 sizes: large (perfect for storing out of season items), medium (great for accessories), and smaller cubes, which are great for stashing odds and ends. I can’t get over how good my shoe/bag cabinets look. I joke that I live in a museum now and have been doing my best to put everything back exactly where it goes when I get home at night. It’s all still perfect so far! Here are a few of the things I learned from our day together. 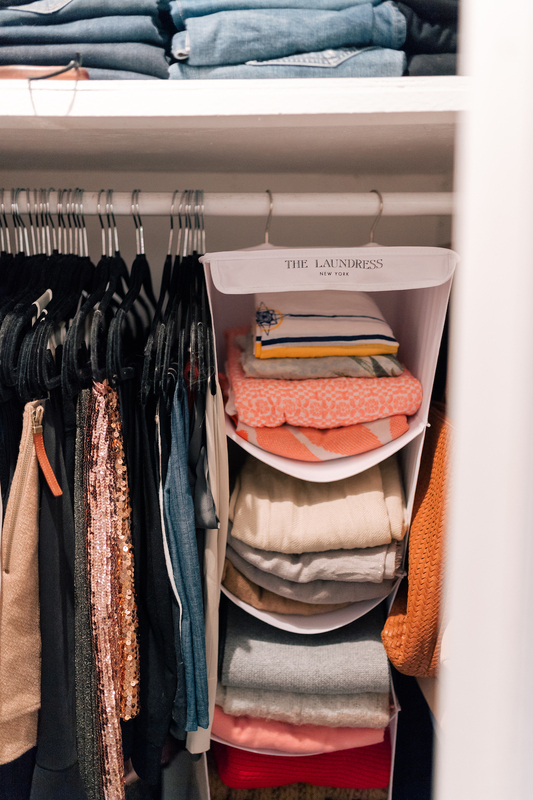 Take EVERY SINGLE THING OUT OF THE CLOSET / area that you are organizing. 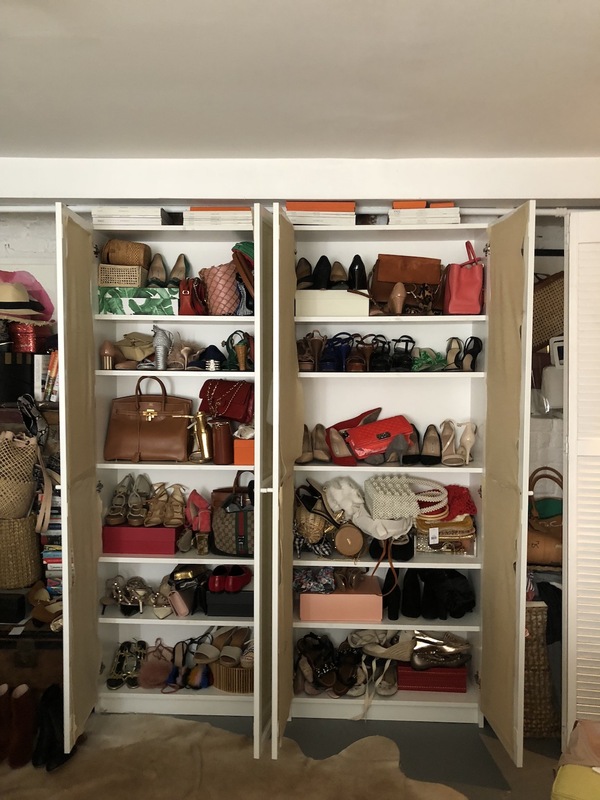 Jamie made me do this and it was especially jarring to see all of my bags/shoes come out of the closets + everywhere else I’d been stashing them. It was a big wakeup call (how did I get all this stuff!?) but also really good to just see it all there and make some tough decisions. Do I need eight pairs of red shoes? Probably not. Really think about how you use things. 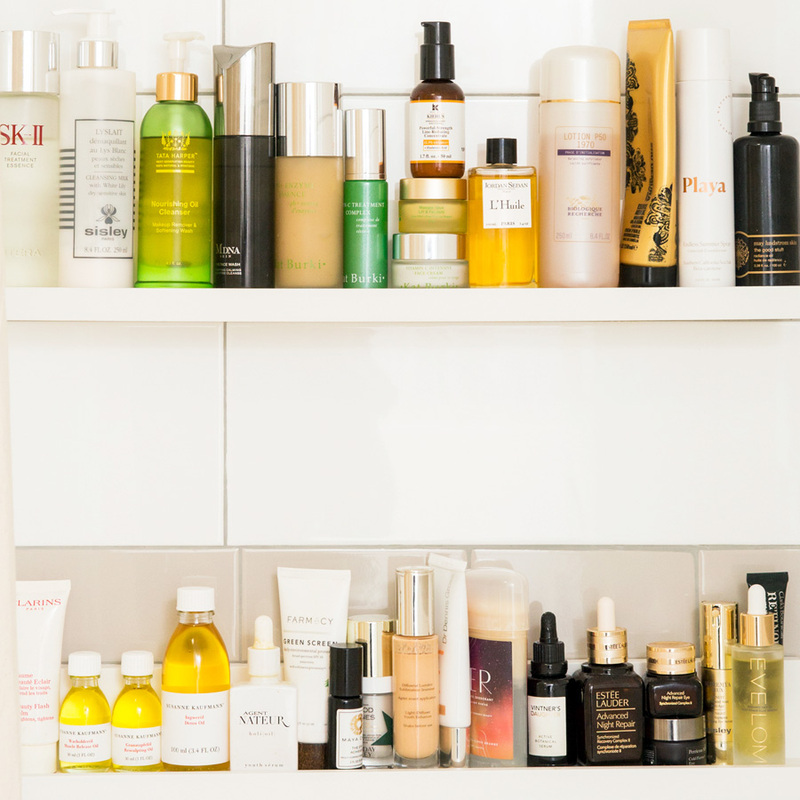 Keep the stuff you use easily accessible. That’s why we put all my scarves in the hanging organizer. We also set aside a special area of the hanging closet to hang things that need to be shot for the blog. DO YOU LOVE IT? LIKE… REALLY LOVE IT? The way that we worked was section by section. We started by going through all of the bags and shoes. Then accessories like sunglasses, scarves, etc. Then we did the smaller closet and then the big one. Some things I immediately knew I wanted to get rid of. Others, I would agonize a bit and then Jamie would be like “Do you love it? Absolutely LOVE it?” When the answer was no, it went in the sell/give away/donate pile. 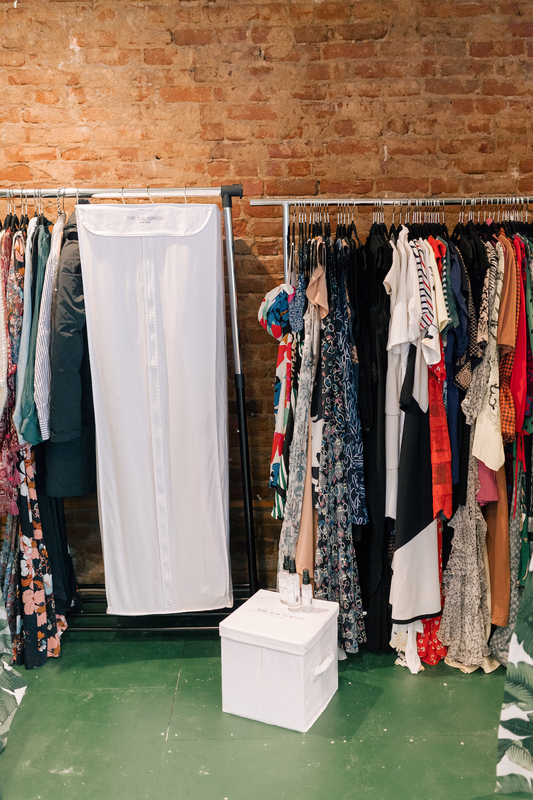 The process took us an entire day and was really overwhelming but I can’t tell you how much better I feel and how much easier it is to get dressed now that everything has been cleaned out. It’s also made me want to shop a lot less. For anything that comes in, something must come out! I honestly cannot recommend Horderly enough. If you want to try their service, you can book on their website. If you mention The Stripe/my name, they will throw in two free hours of organization! Oh and just for fun… the before photos. YIKES. What a nightmare. 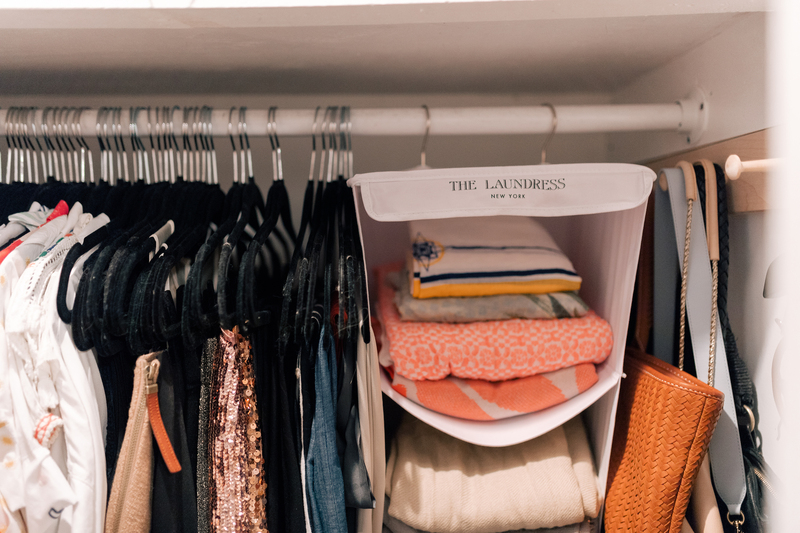 Thank you to The Laundress for sponsoring this post. Photography by Carter Fish. But most importantly, thank you for always giving back to the community, whether clothes donations or monetary, I really admire you for this. And thank you. It will be interesting to see when things start to sell on The Real Real, I’m excited to donate even more! I love everything about this! Thank you for sharing! 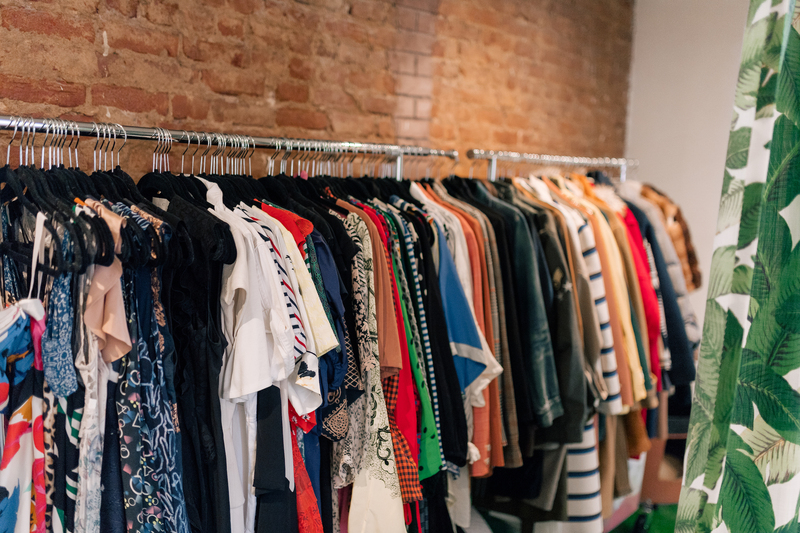 Has getting rid of all those items changed how you shop now? 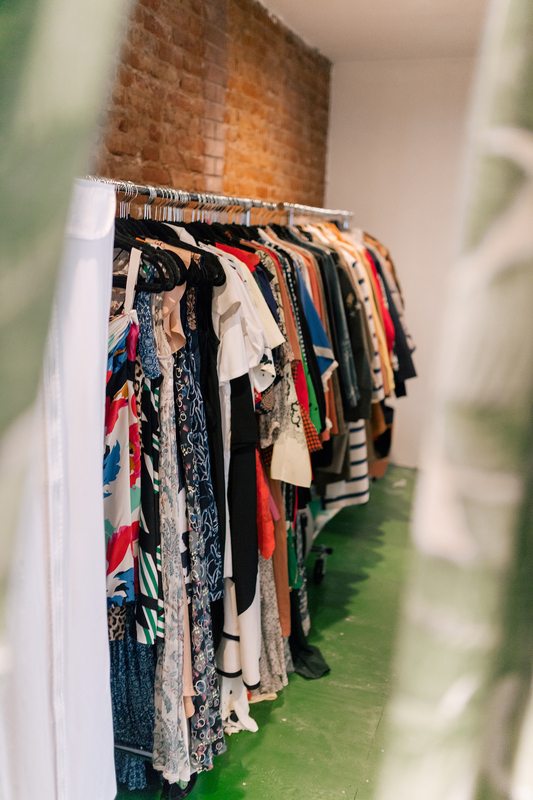 I’ve found that decluttering has made me want to limit the “trendy” items I get and be really picky with the fabric types/quality of my “staple pieces”. Oh my gosh it’s CRAZY. It really makes you want to shop less. Though it’s definitely identified some holes – I need more long sleeve short dresses, oddly! WOW! Can’t wait for them to come to my apt on Tuesday! OH YAY so glad you’re doing it. It’s life changing – let me know how it goes and send pics!!!!! Incredible! I need them too, lol! Such a game changer! Could not recommend enough!!! This was SO satisfying to read and see – loved your ‘after’ shots and those storage solutions look so handy! 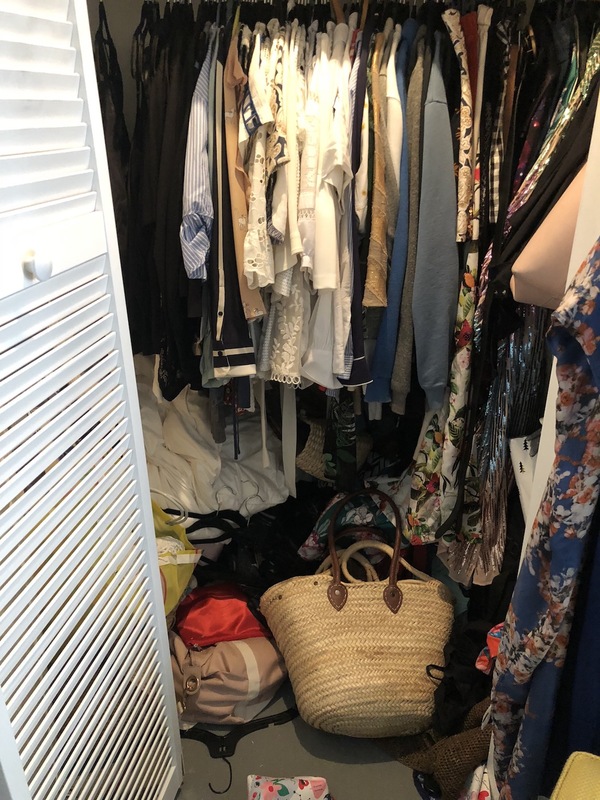 I am secretly the Horderly of all my friends and love nothing more than getting stuck in and organising someone else’s wardrobe (but still wish I could get them to come and do mine to force me to make all those tough decisions). 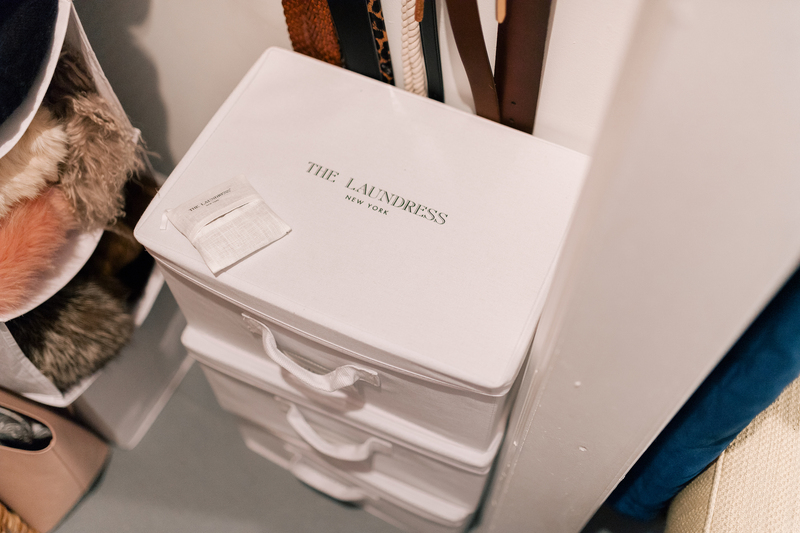 I wish we could get The Laundress here (we can get a few products on Net-a-Porter, but not the full range); I’m such a sucker for beautiful home products that make boring house chores feel a bit luxurious. Ahhhhh I love that you’re that person. I need to be more like that. I THOUGHT I was super organized but after meeting Jamie I feel like a hot mess by comparison! Gorgeous Hermes bag! I gotta ask… is it real??? What does the 6 tier organizer for your scarves look like? My walk in closet is really organized but the mud room one? Not so much. I too have scarves stashed everywhere and shoes stacked on shelves, some falling over. I love your new shoe closets and need something for my scarves. Loved your post! I am a little confused by the question as the 6 tier organizer is prominently displayed in several of the photos, and I linked to it! It’s really awesome. Thanks Janis, let me know if you have any more questions!